— For the past 50 years, the Mission Simulator and Training Facility at Johnson Space Center in Houston has been used to prepare astronauts and Mission Control support teams to fly NASA spacecraft to orbit and beyond. 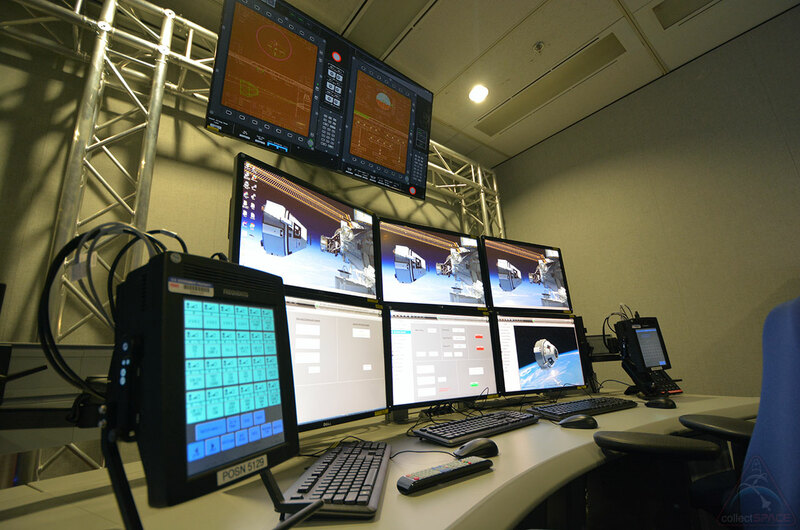 The Boeing Company on Wednesday (Sep. 28) debuted to the media the installation of its first two simulators that will support training astronauts for flights on board its CST-100 Starliner commercial crew spacecraft. 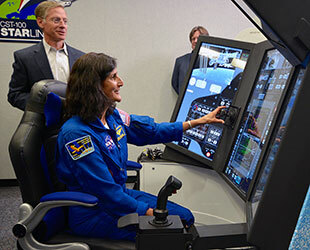 "It's a big responsibility for Boeing to train astronauts," said Chris Ferguson, Boeing commercial crew program deputy manager and director of crew and mission operations, who previously trained in the same facility as a NASA astronaut and commander of the final space shuttle mission in 2011. "This 'plan, train, fly' task is something that formerly NASA had exclusive ownership of, but as part of our contract to provide services back and forth between the space station, we not only provide the service — the taxi, if you will — but we also have to train the flight controllers, the crew, and have everybody ready to go," Ferguson said. In 2014, NASA awarded contracts to Boeing and SpaceXto provide commercial launch services to the International Space Station. The agency awarded a total of $6.8 billion, including $4.2 billion to Boeing for it to complete and certify the Starliner for flight. The capsule, which is designed to fly atop a United Launch Alliance Atlas V rocket, is slated to make its first uncrewed test flight in late 2017, followed by a crewed test flight and then the first of at least two operational missions by mid- to late-2018. 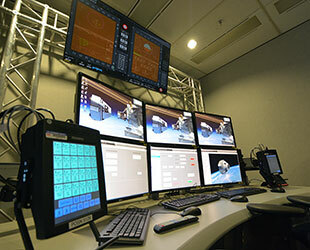 Unlike SpaceX, which has selected to build and operate its own mission control and simulators at its headquarters in California, Boeing contracted with NASA to provide ground support for its Starliner missions. "We have kind of a unique relationship with Boeing," Ellen Ochoa, director of Johnson Space Center, stated. "Boeing has a contract with us to deliver transportation services but we also have people here at Johnson Space Center, in our flight ops organization, who are essentially subcontractors to Boeing for operational products." 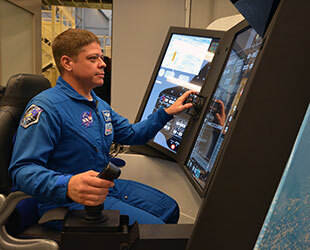 Now up and running in the Mission Simulator and Training Facility (also known as Building 5 or since 1992, the Jake Garn Facility, named for the former Utah senator who flew aboard a 1985 shuttle mission) are Boeing's two Crew Part Task Trainers (CPTT), large touch screen displays that can replicate the layout of the Starliner controls so astronauts can practice flying the different mission phases on a trip to and from the space station. "Where these trainers are ... is right where we spent a lot of time training for the shuttle," said Ochoa, who was also an astronaut. 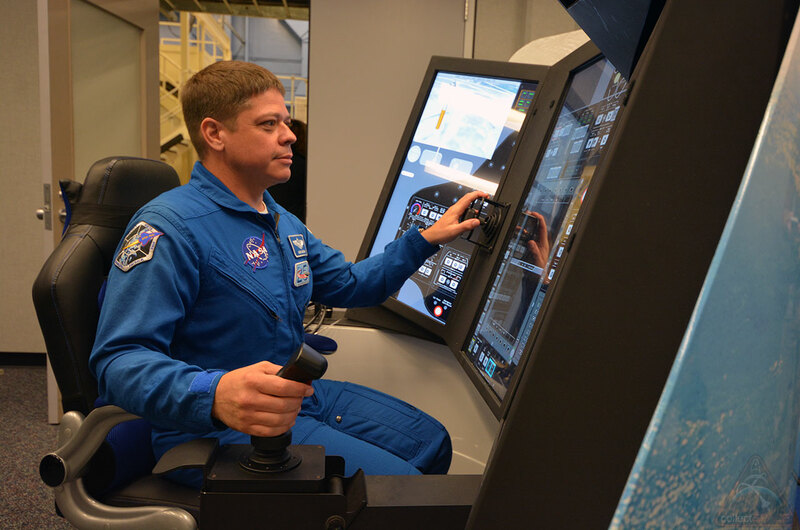 "It's handy for our astronauts because all the offices are right across the way, so that makes it also very attractive in terms of being able to come here and use the part task trainers at any time they want to, but certainly as we get into full mission simulators, it will be very easy for our folks to do the training here." In 2015, NASA named its first "cadre" of commercial crew astronauts to train for flights on both Boeing's Starliner and SpaceX's Dragon. 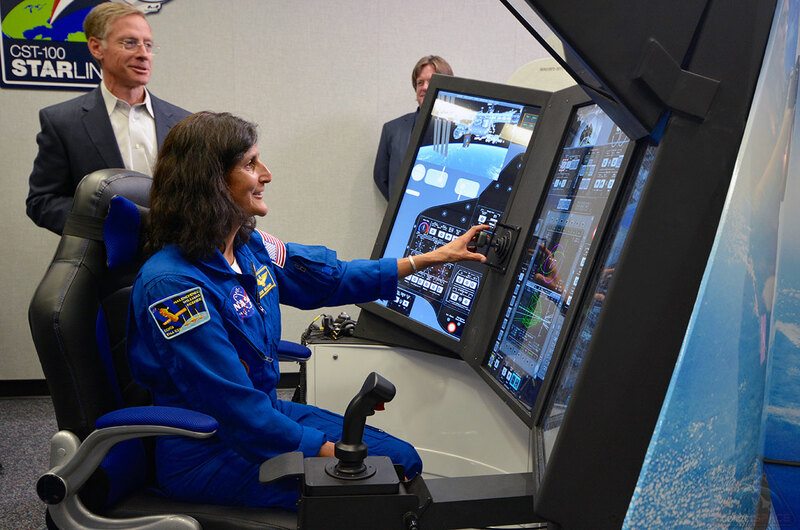 Bob Behnken, Eric Boe, Douglas Hurley and Sunita Williams all made trips to St. Louis, where the crew part task trainers were designed and built by Boeing, to offer their input and gain their first use of the simulators as they were developed. "Bob, myself, Eric and Doug are really excited that they're here," said Williams. "It is sort of like Ellen said, it is pretty nice to be able to go from your office and walk over here to use the trainers and try to understand the systems." "It's a critical part of our development to understand how to operate and fly the vehicle, so we're really looking to using them on a daily basis as we get ready," she said. Behnken, who is a former chief of the astronaut office, said the part task trainers' installation was a milestone. "We've been doing a lot of work where we have sat down with paper products and tried to walk through what ascent into rendezvous or entry would actually look like," he said. "To actually have a simulator where we can actually get a little bit more dynamic data and understand what I would be seeing or what somebody else would be seeing on the ground and figure out how best we would interact, that is the kind of milestone that needed to be accomplished." "We are ready for and it is great to see the hardware here so we can jump into that next phase and get on to flying," Behnken said. 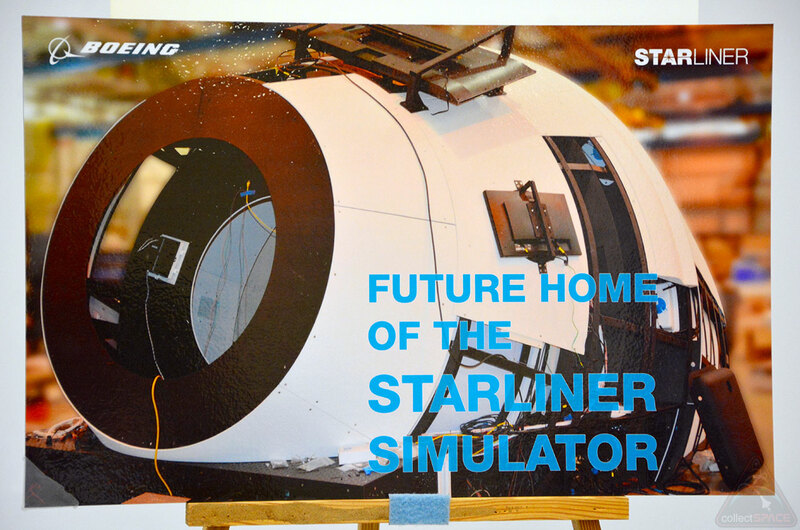 In addition to the crew part task trainers, Boeing is also in the final stages of developing in St. Louis a full-scale, high-fidelity simulator that will provide the same environment as astronauts will find inside the Starliner. 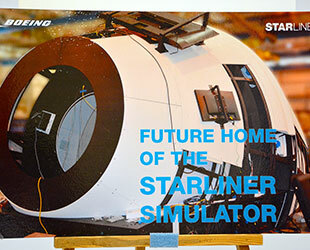 The Boeing Mission Simulator (BMS) is expected to be delivered to the Mission Simulator and Training Facility in early 2017, where it will be installed in the same room earlier used for the motion-base shuttle mission simulator.